I bet that I’ve shopped at every hot tub store in the Triangle looking for a well built spa at an affordable price. Your prices simply couldn’t be beat. Thank you for everything! You guys are the best! 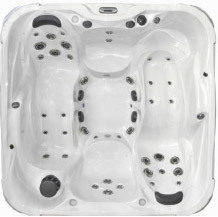 Thanks for a great deal on our swim spa, and thank you so much for the hassle-free sales approach. You really helped us make the right buying decision. I’ve been buying wholesale hot tubs from the Spa & Pool Outlet since 2007. They have taken care of dozens of my customers from the Triangle to the coast. These guys are as professional as they come. I wouldn’t trust my business, and more importantly my customers, with anyone else. They’re a pleasure to do business with. I still can’t believe that you were able to get the hot tub up on to my deck. Thanks for going the extra mile with the delivery. I’m so glad that we found your hot tub warehouse. Our hot tub is absolutely wonderful. We love it!